Smoothound fishing in the Solent can be amazing. In my first report for Fishing Tails, I will take you through a recent trip after the Smoothounds and Rays that the Solent is famous for. Myself and my friend Alan Brown decided to head to a local mark on the shore at Selsey, West Sussex. 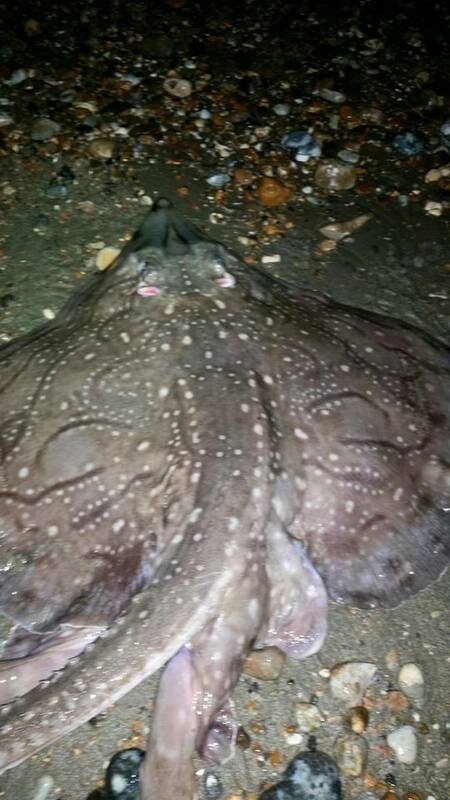 We had heard plenty of good reports earlier in the week so the target fish was to be Undulate Rays and Smoothounds. Low water was around 10pm which was perfect as most of the better fish had been caught during the darkness hours. We arrived around 3pm in the hope of catching an early Black Bream however, we were soon into some lovely Ballan Wrasse. In the distance we could see seagulls feeding on shallow Sandeels which gave us high hopes of landing the rays. It wasn’t until around 8.30pm when the hounds decided to show up. It was literally a hound a cast, all ranging between 3 and 8lb. We used standard Pulley rigs with size 3/0 hooks, the hounds were mainly coming in off the peeler crabs but we brought with us a selection of baits including ragworm, squid and sandeels all from Hookers Baits on Hayling Island. Later in the tide I managed to land a Bass of 1.5lb also caught on peeler crab and although we didn’t manage to land any ourselves, we did see some lovely undulate rays being caught either side of our groins which was great to see. All in all it was an exciting evening, many happy fishermen along the shore, all busy landing fish which is what it is all about. Unfortunately I dropped my camera out of my fishing box and smashed the lens, so I was unable to get any pictures. Thankfully Paul Singleton kindly allowed me to use some of his from that evening. 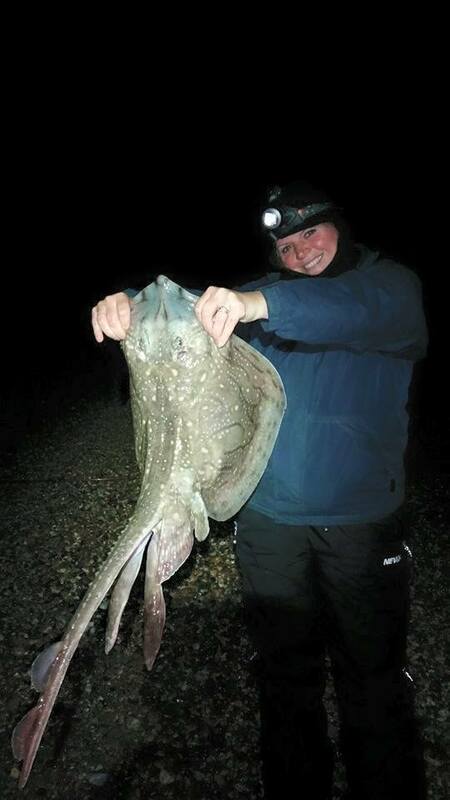 The picture below is of Ellie Kirkman, with a stunning Undulate Ray. Hayling Island: calm with little weed. Hillhead: The wall at Hillhead is producing plenty of Pout and Dogfish on the night tides, but if you are prepared to get your waders on and fish the spit from low water as the tide starts to flood then you still have a good chance of one of the large Thornbacks. It is also a good mark for Smoothound on Peeler Crab. Fish light and be prepared to move back quickly with the tide. Always be aware of the dangers of being cut off. The harbour is full of Thick Lipped Mullet that can be tempted out on bread. It is not unusual to catch the odd Bass at the same time.